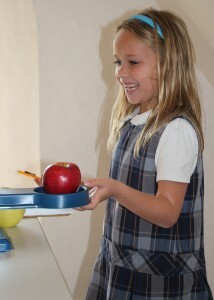 St. Thomas’s Day School is a lively place where children are actively engaged in learning. The smallness of our school is the ideal setting for a dynamic, experiential learning program. We celebrate, nurture, and protect the special qualities of childhood – exuberance, a sense of wonder, imagination, creativity, and innovation. There is a wonderful bond between younger and older children. Our program provides opportunities for children from different grades to interact and develop cross-grade social relationships. Our instructional program is designed to provide continuity and balance while enhancing the development of foundational skills and concepts. The intimacy of small group instruction ensures attentiveness to each child’s maturity and achievement level. Creative projects, hands-on experiences, and collaborative learning opportunities inspire problem-solving and critical thinking skills – the building blocks necessary for thriving in a rapidly evolving world. The core Academic Program includes the language arts (reading, writing, listening, and speaking), mathematics, and social studies. Special subject curricular areas include art, computer science and digital literacy, library, music, physical education, religious education, science, and Spanish. An important aspect of the richness of the St. Thomas’s Day School experience is provided through coordination and integration across these special subject areas. Our broad-based program includes a wide range of enrichment experiences and activities. Students explore their world through an extraordinary series of day and overnight field trips. These trips are an integral component of the St Thomas’s Day School experience and serve as a springboard to deepen learning. Language Arts/Reading: Every teacher is a teacher of language arts. Listening, speaking, reading and writing are tools of communication; the application of these tools is the common thread that unifies the school program. The overall purpose of the Language Arts Curriculum is to inculcate in each student active and engaged listening abilities, skillful speaking, and to develop an enduring appreciation and understanding for the written word, as readers and writers. The nature of the Language Arts program requires a course of study that recognizes two basic elements – the “interrelatedness” of the language arts and their integration across the curricular areas. The “interrelatedness” of the language arts: Listening, speaking, reading and writing are taught in relation to one another and not as isolated activities. The “integrated program”: An integrated curriculum enhances skill development in the language arts, and it enables students to handle content area subjects with greater ease and deeper understanding. 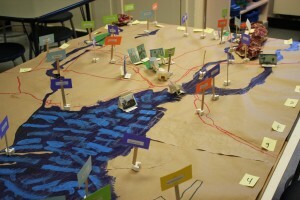 The program strives to expose students to a wide range of language experiences so that they can derive pleasure from reading, writing, articulating and communicating their thoughts and views. The clear, correct and imaginative use of language enables students to absorb the world around them and respond insightfully. The program is based on the developmental needs, interests and capabilities of children. Learning by doing is the emphasis in the language arts classroom. Children are both the receivers and producers of language. Experimenting with language creates results in mastering the form and function of language. Dramatic play, public performances, debates, and presentations empower students to communicate effectively across the discipline areas. Reading skills are developed in a spiraling fashion under the direction of the teacher in small group settings. The reading program provides instruction in the five key elements of reading: phonemic awareness, phonics, fluency, vocabulary and comprehension. Reading skills are introduced in Kindergarten and are taught, taught again and refined to more sophisticated levels as the student progresses through the School. The writing program is rooted in the writing process. The program is structured to develop personal, expressive writing that draws on perceptions and interests of students. Practical (informational) writing skills are integrated across the curriculum. The mechanics of writing and grammar are taught as focus areas and students apply these skills in their written work. Mathematics: The mathematics program is a comprehensive, developmentally based, sequential program designed to empower children to explore, discuss, practice and apply mathematical concepts. The study of mathematics enables students to investigate alternate strategies or solutions. We strive to create an atmosphere in which children are stimulated by the excitement of discovery and the satisfaction derived from understanding, learning, and knowing. The program develops skills in a spiraling fashion across the grades, resulting in a deeper and more refined understanding of mathematical concepts. This process-oriented curriculum is based on the National Council of Teachers of Mathematics (NCTM) Principles and Standards that emphasizes the mathematical processes as problem solving, reasoning, communicating connecting and representing. Curriculum content includes: number and operation, data analysis and probability, patterns and functions, algebra, geometry, and measurement. The sequential and thoughtful use of appropriate manipulatives enables students to see and understand the relationship of the concrete, the representational and the abstract. The aims of the program include mastery of mathematical concepts and basic facts and recognition of mathematics as an important part of everyday living. The math program is designed to develop a strong academic foundation that enables children to expand their knowledge, interpret information, make reasonable decisions and solve increasingly complex problems using a variety of approaches. Through their mathematics experiences, children develop an understanding and appreciation of its beauty, as well as its utility, in life’s activities in our ever-changing digital world. Social Studies: The social studies program is designed to develop values of citizenship including sensitivity, tolerance, respect, and appreciation for others, all of which are required for participating in a democratic, multicultural society. We prepare children to enlarge their understanding of citizenship to extend beyond their local community, state and nation, and to recognize their role as responsible members of the “Global Village”. The curriculum is sequentially and developmentally based. It includes a wide range of activities and experiences from Kindergarten through Grade Six so that acquisition of knowledge is set in a meaningful context. Awareness of world cultures and cultural universals (food, clothing, shelter, economics, social and political institutions, religion, and art).